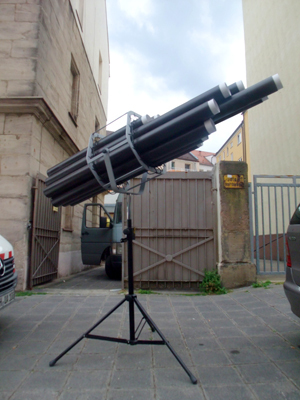 12-tone filter is a mobile sonic object that transforms urban noises into tuned sounds. The object is made of 12 PVC drain pipes connected by elastic adhesive agent. Each pipe has a diameter of 100 mm. The resonance of a tube of air is related to the length of the tube. Pipes of twelve different lengths convert the incoming noises by resonance to different harmonic tonalities. The scale reaches from e to es´ and includes odd- and even-numbered harmonics. Through these tubes, the listener receives a new quality of hearing street traffic, aircraft noises and other strong everyday sounds. In addition, one can play the object like an instrument, fading several tubes in and out. 12-tone filter is an effective transformer of ‘bad noise’ into ‘good noise’. Thanks to its reduced weight, the object is mobile. One person can handle it, focusing on interesting sources. It has the metaphoric appearance of a big anti-noise weapon, a kind of sound-bazooka.